On my first day out roaming the streets of NYC with my shiny new camera, I stopped off to grab a bite to eat. Now you might wonder how I could choose between the many wonderful purveyors of cuisine on the Upper West Side, but it was easy. I wasn’t in the mood for sushi (vegetarian of course), I didn’t want anything too spicy, and heavy comfort food was out as well. So what did that leave? Lenny’s of course, one of my favorite neighborhood cafés. I didn’t get the usual, and went for something I hadn’t tried before. The #10TC on Rye. My co-worker gets this baby all the time, so I thought I’d give it a whirl. It was light, tasty, and hit the spot. Next time I think I’ll try it on marbled rye. 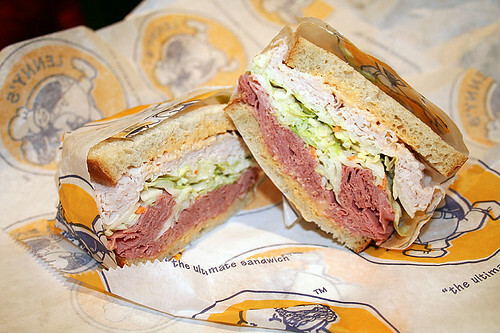 The menu description is: turkey and corned beef with coleslaw and russian dressing. Simple yet sublime. Lenny's sandwiches look like a work of art, and I’ve itched to take a picture since I spied my first one. Wish fulfilled. The next time you are near a Lenny’s step in and try a #10TC. Oh wow! I just got in from a ride and that sandwich looks awesome! I get to go enjoy some kofta curry, which tastes great but doesn't look anywhere near as good as that sandwich. Mmmmm! Wow, you put my Target brand Garden Veggie Sticks to shame. I bet mine aren't as many calories though...I'm trying to be good today. Uncadan8 - Hope your ride was nice. The Mother of Boys - ...yours might be less calories, lol, but mine definitely tasted better. It was, even though I had to ride the Beast. My other (much nicer) bike was outta commission.